Plain and simple, if you visit Maui, you should snorkel. It is a rewarding activity that doesn’t take much skill. If you’ve never snorkeled, you can pick it up quickly. If you are afraid of water, it can be done in fairly shallow regions. Everything is more beautiful in Hawaii and the fish are no exceptions. The wrasse, the yellow tang, and the parrot fish are all vivid in color and unlike fish you have seen elsewhere. If want to give snorkeling a try, your first stop should be a Maui Dive Shop. 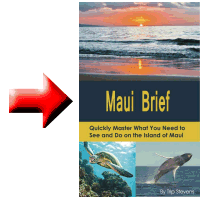 At the time of this writing, there were seven Maui Dive Shops located around the island. There you can rent your gear, ask for the best places to go, and get tips on how to snorkel. You should also pick up their free Maui dive guide. In this guide, you will find maps of the best snorkeling spots on the island, snorkeling tips, and the best thing—its Hawaiian reef fish guide. The fish guide has always been a hit with my kids. With the guide, you can identify all the cool fish you will encounter on your adventure. If you want a more ruggedized version of that guide, you can get a laminated version at a Hilo Hattie. If you are on a budget, you could also visit Snorkel Bob’s for your equipment rental. There are six shops on Maui. They have complete packages of snorkel gear, beach chairs, and umbrellas. Snorkel Bob’s is a unique experience in and of itself. I won’t say too much, but once when I rented some equipment, I was given a bonus stack of paperback books that the founder had written. Again, I don’t want to say much, but they were unlike any other book I had read. The author has quite an imagination. If you do decide to rent from Snorkel Bob’s, you should still visit your local Maui Dive Shop and pick up their guide. Snorkel gear rental is optional. Early on, we decided that we were going to visit Hawaii enough and use snorkel gear often enough that we bought our own and take it with us each time we go. If you are a germ freak, some of those snorkel rental places will gross you out and you will want to purchase your equipment. If you decide to buy, there are plenty of places there to buy, but the quality will most likely be lower than if you had shopped around and bought the equipment before you went. If you are serious about snorkeling, you should go to a high-end scuba diving shop before your trip and get a decent snorkel and mask. It will be well worth your money. When you do visit the dive shops, make sure and pick up some anti-fog solution. Nothing will ruin your underwater exploration quicker than a fogged-up mask. If you can’t see through your mask, you might as well be sitting on the beach with your eyes closed. Spend a little time learning how best to use the solution. It’s a pretty simple procedure. Put a couple drops of solution on the inside of your mask. Spread it around with your finger to make sure the entire surface is coated, and then quickly rinse the mask out. I say quickly because your goal is to rinse off the extra solution but still leave a residue on the surface. It’s all a very simple procedure that you will learn quickly with a little practice. Apply sunscreen thirty minutes before getting into the water. That time is necessary for the lotion to absorb into your skin. A quick application before you dive in does not protect you, and the sunscreen rinses right off and becomes another pollutant that the fish must deal with. As you float motionless in the water watching fish, your back is an excellent target for the sun to burn away. Protect yourself. This is an ideal time to wear a UV-protected shirt. While fascinated with the different tropical fish, it is easy to lose track of time and not realize just how long you have been exposed to the sun. On the topic of the sun, drink plenty of water before you get in the water. It is important to stay hydrated while that sun is beating down on you. And it is easy to underestimate just how dehydrated you are because, after all, you are surrounded by water. – On the west side, my favorite spot is Kapalua Bay. It is small and enclosed, which makes it a protected area and safe for kids. I have seen all nature of fish there. It is a popular spot with limited parking. For smaller crowds, visit it in the morning or at dusk. – On South Maui, La Perouse Bay is the most exotic spot but not the place for beach lovers. To get there, you drive as far south as you can on Makena Road and take a dirt road out to the bay. Then you need to trek across some lava rock to get into the water. That alone will filter out most of the lazy tourists. I have often been there when those in my party were the only ones there or we have shared it with just one other party. The marine life is awesome, and this is the only place on Maui that I have swum with dolphins. – Another location on South Maui worth mentioning is Black Rock. This is on the north end of Ka’anapali Beach and is a great place for beginners. You can walk out in fairly shallow water, poke your head under the surface, and see tropical fish swimming all around you. Be sure and focus more toward the Black Rock up north as that is where the majority of the fish will be hanging out unless there is someone in the water distributing fish food. This location is also very convenient if you are actually staying on Ka’anapali Beach. I have often gotten up and snorkeled for an hour or two while my family slept. One morning when I was staying on Ka’anapali Beach, I woke early to go for a snorkel and dressed in the dark. After I got out of the water, I realized I had a camera in my pocket, but that’s another story. 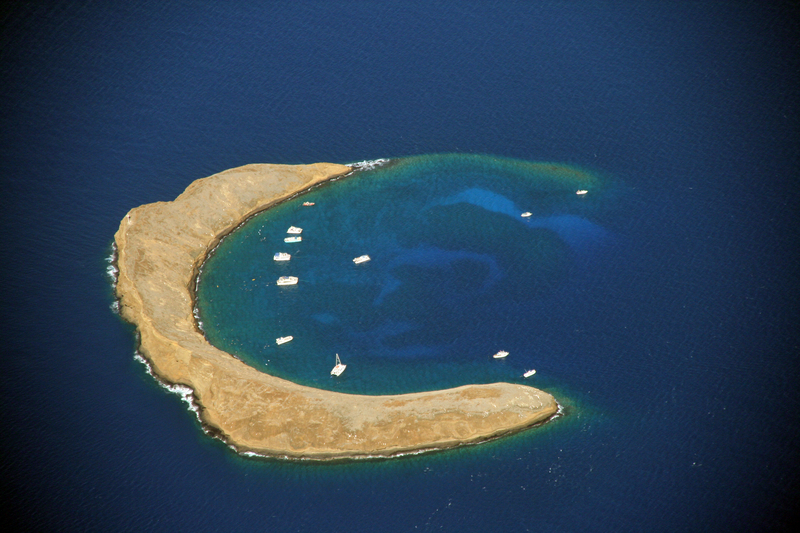 – Probably the most popular snorkeling spot is not exactly on Maui but out at Molokini, a sunken volcano on the west side. You must take a boat out to Molokini, and for sure, you will see larger fish than those you see at other sites closer to the shore. Ten years ago, Molokini was the best place to snorkel near Maui, but the popularity has driven boat tours there around-the-clock with the results being diminished visibility with fewer fish and considerably more people. 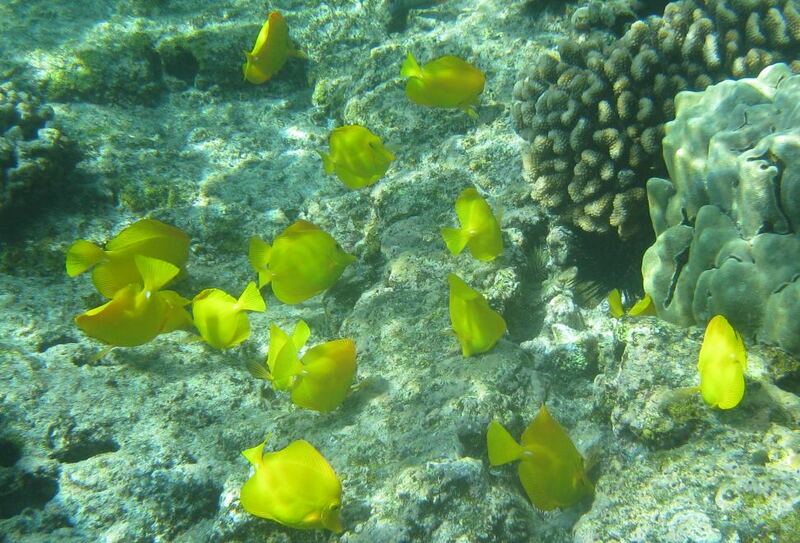 The best sites to snorkel on Maui are the on the west and south sides. If you want to try the east side, there are places like Hamoa Beach, but they are just not as good and typically less safe in the winter months. Other places to consider would be the islands of Lana`i and Moloka`i, which require taking a boat, but you are rewarded with far fewer people and magnificent diving spots.